Just like people who need a break from living in the snow and cold, I figure my blog needs a break from the same! 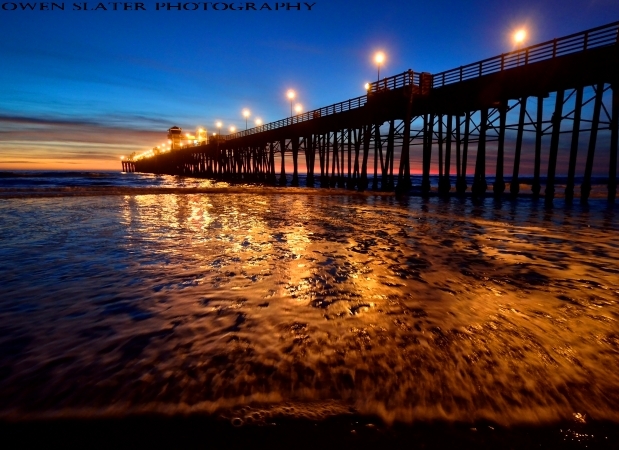 Here is a photo from a recent trip down to sunny, warm southern California! The sunset was spectacular that night. From surfers to people combing the beach for hidden treasures, everyone seemed to stop and take in the amazing colours. Please click on the image to view a much larger version. Similar to surfers, pelicans have figured out how to harness energy from waves. However, it is actually more closely related to what a pilot does during take off and landing than to surfing. Interestingly, it appears pelicans are one of only a few coastal birds to have figure this out. By flying so close to the rolling wave, they are able to gain lift, speed and decreased wind resistance created by the air that gets trapped between the water surface and the underside of the wing. This air cushion essentially supports the bird’s weight just above the water’s surface. As the wave increases in height the pelican rises up parallel to the wave to maintain lift. Just prior to the wave breaking, the bird will then descend along the leading edge of the wave, gaining speed along the way much like a surfer does. By doing this they can greatly increase their flight speed without ever having to flap their wings. 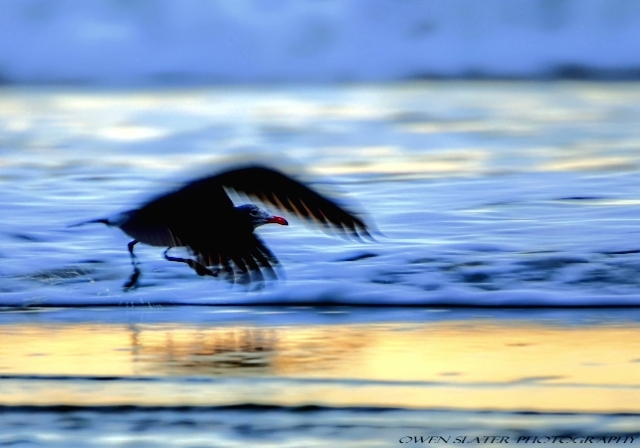 The key for the pelican is to build up as much speed as possible before the wave breaks. Just as the wave starts to crash over itself the pelican resumes flying to get above the resulting air turbulence. As the next incoming wave moves into shore they reposition themselves along its leading edge and repeat the maneuver. In this way they can travel much longer distances much more quickly and with less effort than other birds. While pelicans and albatross were showing us how to use this effect well before we recognized its existence, it wasn’t until the Wright brothers came along that anyone used it. Even then, no one knew what it really was. Now the phenomenon is well described and in the aviation world it’s known as ground effect. Anyone that has flown in an airplane has felt this either at take off or landing. In large planes it is most noticeable just before landing, when the plane seems to hover just above the ground and actually gain speed just prior to touchdown. In small planes it is more noticeable at take-off, when the pilot maintains the airplane just off the ground to help increase the ground speed before ascent. Next time you fly watch for this effect and you will surely notice it if you haven’t already. Enough of the winter photographs from Alberta for this week. Back in California I took this photo near the lighthouse at Point Reyes. 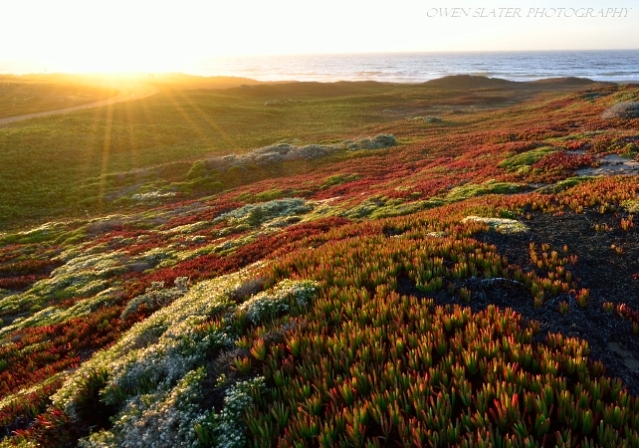 The dominant plant in the landscape is known as ice plant (Carpobrotus edulis), which was originally introduced from South Africa to prevent soil and sand erosion. However, the plant has become invasive, strangling out other native species. Making matters worse, since the plant has a shallow root system when it rains the leaves engorge with water, get too heavy and actually cause entire slopes to collapse when the roots can no longer support the weight of the plant. Efforts are ongoing to remove it from much of the coastline to restore the landscape to its original form. Complicating efforts is its appeal with local gardeners for the bright red colour that the leaves turn in the fall. PS. Too all the Boardwalk Empire fans out there…sorry that your favourite character was killed off in the TV series. However, thanks for checking out my site! 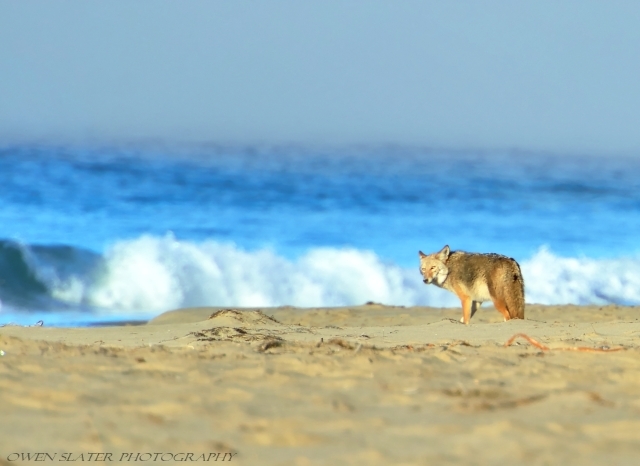 The beach combing coyote used its strong sense of smell to locate breakfast along the shores of Point Reyes. It paused briefly over the body of the deceased harbor seal pup before feasting on the left overs. Once full, it wandered off leaving the what remained for the turkey vultures, ravens and crows. 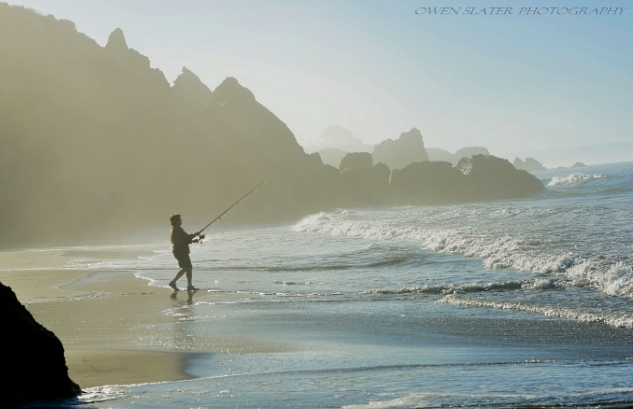 As the fog lifts over the Pacific ocean, a fisherman casts into the waters off the coast of Northern California. Shortly afterwards he reeled in what he initially thought was a big fish, only to find a tangled mess of dead seaweed on the end of his hook. 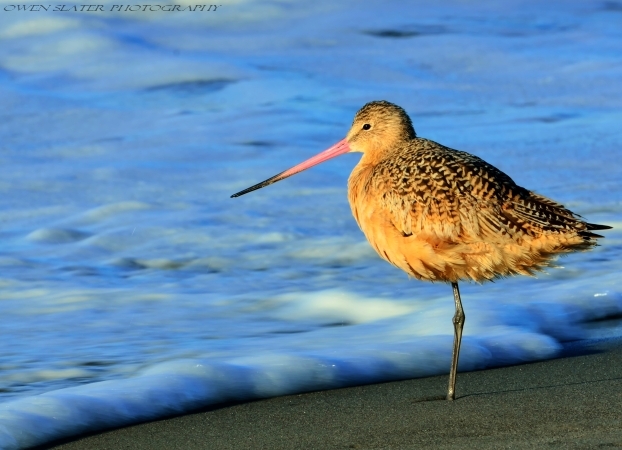 Marbled godwits are common along the coast of California. This one rested on one leg on the shores of Stinson beach as the sun rose above the hills. Many areas along the coast have implemented strict laws regarding where dogs can be walked or let off leash in an effort to give the native wildlife a chance to rest, nest and feed without being disturbed by the curious canines. With over 25 centimeters of snow to fall within the next day in Calgary, I find myself thinking back to about a week ago when I was on a warm beach in California! 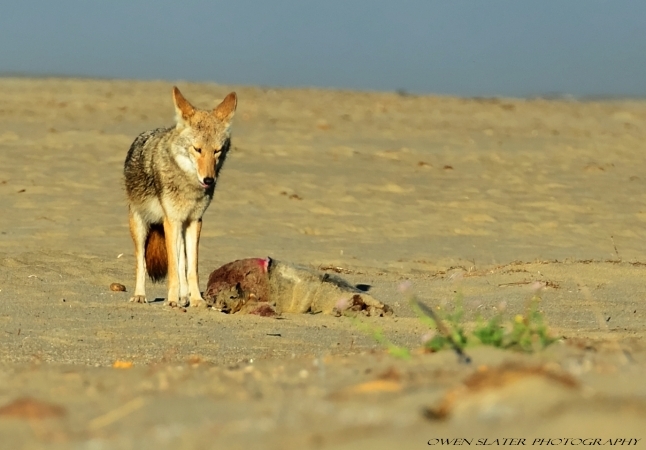 On this particular morning, I watched a beautiful sunrise before coming across a lone coyote feeding on the carcass of a harbor seal pup. After eating its fill it walked about 100 feet away from me combing the beach for other washed up delicacies. On a recent trip to California I went on a short road trip up to Point Reyes. Along the way I stopped at Stinson beach. Just as the sun was setting I found some Heermann’s gulls to photograph. I have been trying for quitesome time to get a good photo of a bird in flight with the wings in motion and the head in focus. Add in the droplets of water being kicked off the bird’s feet as it springs into the air, the sunset reflecting off of the water and the motion of the incoming wave and I’m thrilled with the result! This split boulder sits on top of Lembert Dome. Giant sequoias towering over the Mariposa Grove museum, Yosemite National Park. With hundreds of wild fires burning in California the sun was a deep red thirty minutes before sunset. This photo was taken from Tuolumne meadows.